Generic Company Place Holder Livestand from Yahoo! 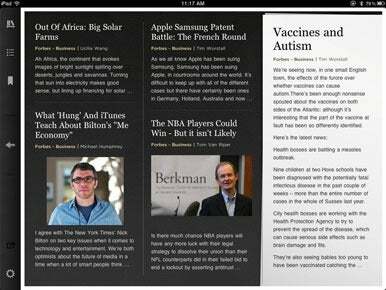 Yahoo’s free news-reading app, Livestand, is great to look at and fun to use. But the core of any news-reading app is the news, and it’s on that front the app stumbles a bit. Livestand builds on the model created by the Flipboard and Zite apps, which aggregate news stories from your chosen sources and display them in an elegant magazine-style layout. Interface-wise, Yahoo has actually improved on those earlier apps, which display every story in more or less the same, clean white layout as every other story. Livestand instead offers dashes of colors and different templates for its displays, giving the app a visual zest its predecessors lack. By Design: Livestand by Yahoo improves on the design of other iPad news aggregators with different templates to display stories. The navigation in Livestand can be a bit counterintuitive, however. You must swipe up-and-down to view different stories from a single news source within the app; swiping left-and-right takes you to other sources—akin to flipping a magazine page to find an entirely new magazine. Adjusting to the quirks of interface would be no problem if Livestand’s content were worthy. It’s a tricky question. I’m a fan of hard news and political commentary; Livestand offers 20 news sources in this category. That pales next to Flipboard and Zite, which pull from nearly every news site in the universe. While some of the available sources are desirable—like news from ABC and ProPublica—the source list is weighted heavily to Yahoo’s own news and commentary blogs. If you read those blogs, Livestand will prove useful. The app also seems to regularly experience technical glitches. The layout is often permeated with boxes featuring “unable to load” messages, and several political blogs appeared to be a week out of date while I used the app. Livestand is enjoyable to use and would be even better if it offered an expanded array of content. Right now, though, it feels like there should be more there there.